In the Church's year Advent is a season for reflection and preparation, rather than jollification and spending money, and it was these themes which seemed to run through Arcangelo's concert at the Wigmore Hall on 14 December 2016. Artistic director Jonathan Cohen had chosen a trio of cantatas, two by Bach and one by Telemann, which reflected on life and looked forward to the life to come. Taking advantage of some relatively unusual scorings, Bach's cantatas Christ lag in Todesbanden BWV4 and Gottes Zeit is die allerbeste Zeit (Actus tragicus BWV106) and Telemann's cantata Du aber, Daniel, gehe hin TWV4:17 were joined by Bach's Brandenburg Concerto No. 6 in B flat BWV1051 with its scoring of violas, violas da gamba, cello, bass and harpsichord. For the cantatas Arcangelo was joined by the singers Lydia Teuscher (soprano), Alex Potter (counter-tenor), Andrew Tortise (tenor) and Thomas Bauer (baritone). 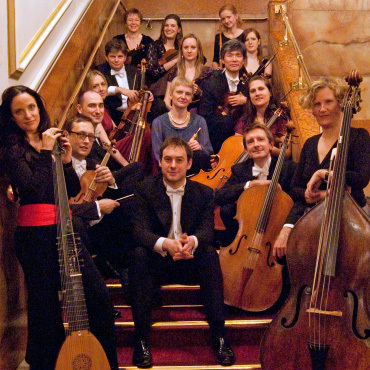 The concert was also the first in Arcangelo's residency at the Wigmore Hall. We started with Bach's early cantata Christ lag in Todesbanden, dating from 1707/1708, which sets verses from Martin Luther's Easter Hymn of 1524 as a chorale cantata, each verse a different variation on the chorale. Scored for relatively simple forces (four voices, two violins, two violas, cello, double bass, lute and organ), the opening sinfonia was grave with a strong textural quality to each of the instrumental lines. In the first coro we were aware of the singers being embedded in the ensemble, and the music reflected this with vocal and instrumental lines surround the chorale sung by soprano Lydia Teuscher. A plangent duet followed, for Teuscher and Alex Potter, the two lines weaving together over an instrumental accompaniment which was strikingly pointed, yet we were also aware of the primacy of the words (always a major factor in church cantatas). Andrew Tortise's aria was in fact a vibrant declamation of the choral with vigorous violins over the top, and all came to a striking halt at the words when death loses its sting. After a coro where all, except Alex Potter (singing the chorale), pointed the vigorous lines, there was an aria for Thomas Bauer where his grainy baritone voice added an attractive quality to the flowing vocal line, supported by a busy cello part. The second duet, for Teuscher and Tortise, accompanied just by continuo, had a lovely swing to it with phrases of the chorale growing into flowing lines engagingly articulated by the two singers. The final chorale was relatively a straightforward tutti. Telemann's cantata Du aber, Daniel, gehe hin was written for an unknown occasion and survives in a manuscript collection created by the cantor of a church in Berlin. The text is for a funeral cantata, describing Daniel (presumably the deceased) going to sleep in Christ so the different movement use a lot of night and sleep imagery. It was scored for four singers, recorder, oboe, violin, two violas da gamba, cello, double bass, lute and organ. The appealing opening sinfonia had lovely intersecting oboe, recorder and violin lines over the violas da gamba. In the first coro Telemann supports the voices with instruments except for the phrases 'gehe hin' (go forth) and 'und ruhe' (and rest), thus providing emphasis to these words (the nub of the cantata's subject). After recitative from Bauer, with fine attention to the words, he continued with a very striking multi-section aria where Telemann moved between sprightly and lyrical sections linked by quasi recitative. An accompanied recitative for Teuscher led to her aria where a lovely instrumental melody was taken up by the vocal line to create a beautiful moment, complete with striking plucked instrumental texture with Thomas Dunford's lute to the fore. A characterful recitative from Bauer led to the final coro which again had a seductive instrumental texture emphasising the serenade-like nature of the piece as the singers repeated 'Schaft wohl' (sleep well). This was Telemann at his most mellifluous and I wondered that the cantata was not better known. After the interval we had Bach's Brandenburg Concerto No. 6 in B flat which effectively formed a showpiece for the violas and it was nice to hear them off the leash for once. The opening Allegro had a real infectious bounce to it, with some warm chestnut timbres from the two viola players. The central Adagio was more plangent, with two intertwining lines over quite a rich underlay. There were some fabulously flowing textures in the final Allegro with a lovely bounce to it. Throughout we got a strong sense of personality from the players as the eight of them gave us real chamber music. The final work in the programme was Bach's cantata Gottes Zeit is die allerbeste Zeit written in 1707, perhaps for the funeral of his uncle. Scored for four singers, two recorders, two violas da gamba, lute, organ and double bass, the opening sinfonia is deservedly famous with its prominent recorder parts (finely played throughout the cantata by Rebecca Miles and Ian Wilson) combining with the other instruments to create some lovely timbres and textures. In the opening chorus the voices mixed with these instrumental textures in a striking way. Andrew Tortise was beautifully controlled (despite the high tessitura) and rather moving in his solo, whilst Thomas Bauer was more vigorous. A fugal coro for the lower three parts wove itself round Lydia Teuscher's poised solo, and then Bach repeated the procedure as Alex Potter's lovely liquid tone in his solo was combined with Thomas Bauer's strikingly contrasting tones in counterpoint. The final coro had lovely instrumental flurries at the end of each line of the chorale, ending in a vigorous fugato. There is often a vibrancy to the music making in Arcangelo concerts, and this was very true here so that the performances had an engaging quality which went far beyond simply performing the notes and brought out a very real sense of communal personality. You sensed that all involved were enjoying themselves, and this came over in body language, so we certainly enjoyed ourselves too. We were rewarded with a repeat of the first section of the lovely final chorus of the Telemann cantata as an encore.